Didn’t Your Mama Ever Teach You Any Table Manners? Mid summer is a time when the Bird Buffet is inundated with fledglings – last week I wrote about a titmouse who was unwilling to cut the apron strings. I’m glad to report that I witnessed him opening and eating his own sunflower seeds today. Still, his screeching for his mama continues unabated. I have the feeling he’ll be living at home until his student loans are paid off. Todays subject on Fledglings Behaving Badly, is not a mischievous titmouse, it’s a youngster from a fine upstanding family, known for their fine manners. They don’t screech, they don’t fight, they don’t hand upside down from the chandeliers. 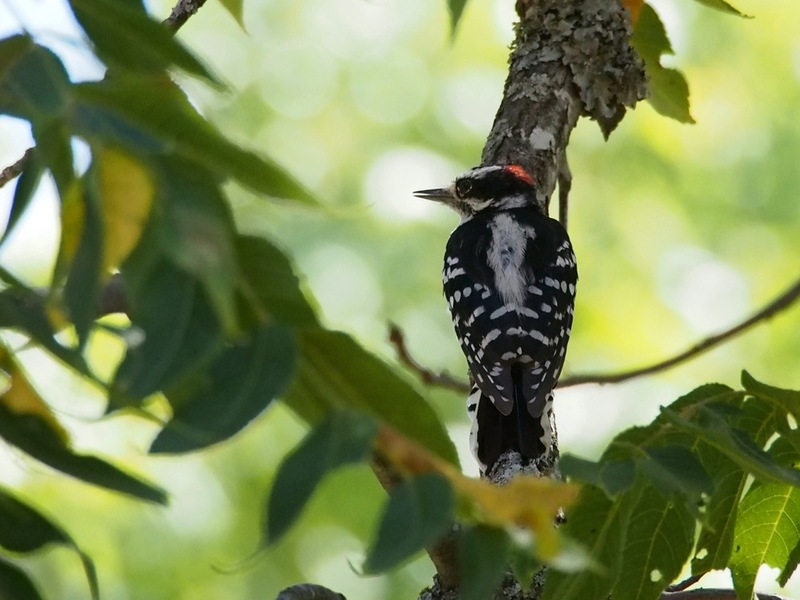 The Downy Woodpecker is the very picture of a well-mannered bird. 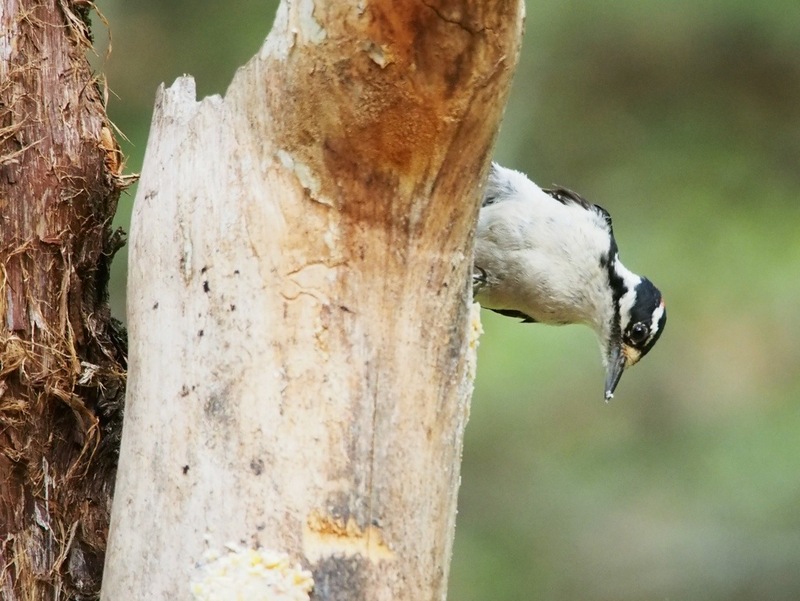 This is a Downy being a Downy – walking along a tree limb looking for bugs. Downies are sweet birds, they become accustomed to humans very quickly and even share their feeders easily. They are likable little birds – the kind who grow up to be upright citizens. Every once in a while there’s a bad apple, a bird that no amount of parenting and discipline can manage – a hellion that upsets the whole neighborhood. This kind of behavior cannot be tolerated at the Buffet! I suppose she thinks that if it’s alright for the hummers to dive bomb each other over this feeder that she can do whatever she likes, well she’s wrong – dead wrong (not really, I could never hurt her). Click through this next gallery to see our stop action surveillance of the perpetrator. After this incident, the youth in question was seen hanging upside down on the woodpecker feeder. She was last seen leaving the Buffet on a motorcycle with a sketchy looking bluejay. She’s gonna have one heck of a hangover in the morning. Parents – tell your fledglings about nectar. There’s nothing sadder than a young woody throwing her life away for a sugar high. This entry was posted in birds, Ozarks, Photography, wildlife and tagged Arkansas, bird feeding, birds, downy woodpecker, Hummingbirds, Olympus, Olympus E-M5, Ozarks, photography, Woodpecker by artsifrtsy. Bookmark the permalink. The shots capture the peacefulness of the day. It was a peaceful day – first rain in weeks. Never leave the good stuff out for the kids! Boy, ain’t that the truth. I thought they were hopped up on berry suet – and now this. Sugar is the new crack. She’s an odd duck – I was wondering why that feeder was being drained so fast! Someday she’ll be a fine lady. A sad story – but it had to be told – lol! our young finches are still hounding their poor parents – wouldn’t be surprised if they moved with no forwarding address. Had a little more rain today and cool temps – spent the day on the porch in late July – wonderful! I spent all day on the porch too. No need to water the garden – loved it! I hope we get more days like this this week. I’m sending that downy to rehab, pronto! Loved the narrative. These birds sure do make for great photos. They do offer a lot of contrast and they look pretty striking against the hummingbird feeder – what an odd little thing. Haha – I like the way she’s reclining on that feeder. They sure do – she’s tried everything but the woodpecker feeder. I know, right? Her folks are so embarrassed. I have faith that she will turn out OK though. If not the hummers will scare her straight. OMG, just love the story that accompanies these wonderful photos. There’s nothing sadder than a young woody throwing her life away for a sugar high. hahaha! I jus couldn’t believe my eyes when that bird landed on the hummer feeder – there was no perch. It was reclining on the surface. So weird. I hope her family sets up an intervention soon. The Downy has become a bird I enjoy watching. I didn’t realize they came from such a good family!